The hull plating of this 550 Centre Console Coraline is the standard item, but almost everything else was subject to some form of customising. Understandable with an owner who is single minded in his devotion to a narrow fishing speciality: tag and release tuna and bill fishing. It’s not clear whether the opportunity came before the yen set in, but he certainly has the perfect set up for a game fisher: frequent business trips to Exmouth with spare days to wet a line. Fishing will be a solo operation, and the boat has been built emphasising self reliance: two of everything - motors, batteries, fuel tanks. The odds on a motor not getting the 550 home are remote indeed. Twin motors also fit the bill for trolling. 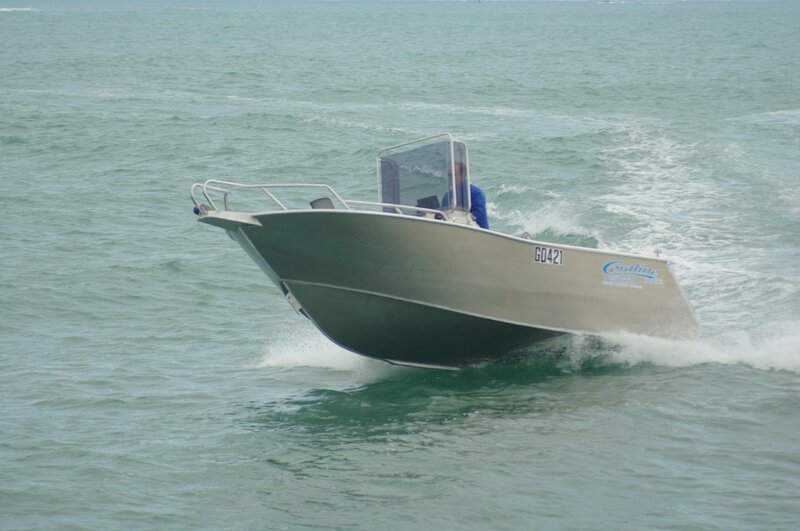 Twin 70hp Yamaha four-strokes provide blistering speed for travel and effortless trolling with one shut down. These Yamahas are ideal for the job being light weight for their output. At the transom what looks at first glance a boat builder’s mistake is actually another part of the owner’s specification. The door, which lifts off, is to port but the boarding ladder is to starboard. The catch gets priority here, with tagging, de-hooking and handling generally taking minimum time in the doorway. The detail of the thought the owner put into this boat has to be unique in an 18 footer. The side pockets were built to suit the length of his fishing rods and carpet lined to pamper them; the bow rails dip aft of the first stanchion to be convenient for throwing the cast net; the normal catch tank has been much enlarged and is set athwartships (he is not ruling out bringing the odd fish back). Top of the line outrigger mounts are precisely located inboard near water level. The console is a beefy structure with enough size to give useful protection. The windscreen too is large in area, supported by a pipe frame with ample strength to double as supports for a couple of standing passengers. It hinges down to reduce air drag when on tow. The seat provided is a single with a reversible back. The only other seat on board is a swivel that generally lives in a socket in the forward platform. Unlike the run of the mill centre console the 550 offers plenty of enclosed stowage volume. Odds and ends will fit under the platform, but real capacity is within the pair of console lockers, beneath the driver’s seat, and in two transom lockers. There was a little fierceness in the review day’s weather off Hillarys – certainly more than typical for the North West Cape – and the Coraline just ate it up. The current series of Coraline hulls have a first class reputation for ride quality, but I am sure the twin fuel tanks played their part in a further improvement. Nearly full, they added mass to the hull - and mass in the right places. The tanks, fore and aft of the console, held the trim spot on. With 140hp on tap performance was as exhilarating as we could want it, and the quality of the steering gear only enhanced it. Finger tip hydraulic is welcome both travelling and manoeuvring, but a simple addition improved the latter: a knob on the wheel. At times when wheel and throttle are needed simultaneously – berthing, driving onto the trailer – the knob is worth its weight in gold. The Coraline sits on an aluminium trailer also built by Coraline. The structure holds down trailing weight – a real asset on Perth Exmouth runs – but the trailer’s most practical feature is the ease it brings to drive on and off operations. These are further enhanced by the auto catch and release device, making sessions at the ramp into genuinely quick and easy one person jobs.